(From Nikon lens literature) Versatile wide-angle lens for a broad range of uses. Fast f/2 maximum aperture make this ideal for low light, hand-held shooting. Nikon Super Integrated Coating for minimized flare and ghost, providing good color balance Compact, lightweight wide-angle lens. A sensible lens and a breath of fresh air. As good technically as it needs to be. The borders and corners do lag on this lens more than normal at all apertures, especially at f2. For the life of me I don't know why this is such a big concern to anyone other than pixel peepers. The subject never is placed on extreme edges and it's simply not noticeable, in my experience, unless you pixel peep. If you're shooting wider with an isolated subject, the corners are blurred out anyway or they're dark. Like all lenses everything sharpens up stopped down a stop or two. For whatever reason -- some say it's due to fewer elements, this is one of those lenses that has 3D pop -- a nice non-quantifiable qualitative property. Love the natural color rendition of this lens, has a film-y quality on digital cameras. I totally dig its small size, weight (and reasonable price tag) compared to the modern expensive behemoths in this focal length. I prefer screw mount lenses because I don't trust the durability of the tiny silent wave motors built-in to virtually all newer lenses both made by Nikon and 3rd-party. This lens remains a favorite among food photographers for its close focus capabilities. It's a natural for events and because it's so small it can turn a D600, D610, or D750 (the smaller Nikon full frame cameras) into viable street shooters. Small enough to pop in your bag (or pocket) and not worry about it -- you won't think twice about taking it along. Look at 500px and see some samples of the beautiful output this classic Nikon is capable of before spending much more on the larger more modern 35's. This is a shooter's lens, not an "internet MTF chart obsesser" lens. A tad soft wide open. Needs screw on hood. I think this lens is a pretty good FX lens, especially when used on a forgiving camera like a D3 or D700. For people and groups, it does a superb job. On my D700, I've made credible landscapes and scenic shots at f/8. I think it's a very nice lightweight companion which is often underrated by novice and DX shooters. I own both the 35 f/1.8 DX and this lens and would more often choose this lens just to get the better build quality and depth of field scale. Prior to FX, I made quite a few large gallery prints with this 35 f/2 which still sell well to this day. When adding a good B+W polarizer and Nikon's metal screw-on hood, you get a nice handle to rotate the polarizer. It's small enough to store with the hood attached. You can't reverse it anyway. My newer Nikon 28 f/1.8G has replaced this lens as a standard walk-around on my D800, but I still hold a healthy respect for it today. With hood attached, it still fits in your pants pocket better for a 2 lens walk-around solution on holiday. It's a good 35mm lens for Film/FX users. I have used it since I was shooting films with my F90x. For 35mm films or FX sensors, it's ok. It produces decent images in term of quality. You won't expect a 35 summicron quality from this lens. Use it properly, it will provide you with good images. One thing that keep bugging me is sometimes this lens got a lil bit overrated. Use any DX camera? The AF-s 35/1.8DX is world's better lens than this, for the similar price. Good lens to travel light with a DX camera like the D7000. The 35/2 is not a fast lens (like the f1.4), but the out of focus quality is really good, and using this lens at wide apertures is a real pleasure both in DX and FF. I think it's too soft at f2 (but it could be good for portraits), but I love the results at f2.8 and f4. I'm extremely surprised to discover the distorsion (barrell) is more visible in DX than in FF, probably due the perspective, but the correction on camera and in Lightroom are effective. The out of focus has very little CA, and fringinf appears quite rarely (and again, Lightroom is very effective to correct the problem). Colors are less vivid than the more modern lenses, like all the "old style" Nikkor lenses, and the shadows keep a lot of details. Light and very cheap, I like the star effects you get with it at night. It is very soft in the corners wide open but great for group shots when stopped down to f8 where every face is in very sharp focus and I particularly like the star effects I get from it when shooting at night - on a tripod of course because its sharpness is just mediocre wide open. It's personal preference of course, but I just love this lens on a full frame camera for people photography! The 35mm focal length is perfect for what I do most of the time. It's a focal length between a wide angle and a standard lens. It's also very small and lightweight so it doesn't get in the way and it's not intrusive. I think it's also very nice for documentary and street photography. I find the sharpness and contrast at f/2.8 good and at f/4 and smaller it's very good. Except for the corners, that always stay slightly soft. To me this is not a problem, since I don't use it for architecture or landscape photography and I do not place my subject that close to the edge of the frame. This lens focusses very close and enables you to make nice close-ups and still show some of the surroundings. Of course there is distortion since it's a moderate wide angle. I find it focuses fast and accurate too. In Adobe Photoshop or Lightroom the moderate distortion can be easily removed by using a lens profile. There is the f/1.4G behemoth version, but I just can't justify it's price when I compare the performance, size and weight of this lens with the compact f/2.0 version. Yes, this Nikon AF 35mm f/2.0 D is a great little lens and I would really recommend it if you like to keep it simple and if you often use the 35mm focal length. On D700, center sharpness is good even at F2. To attain peak performance, use it between F5.6 and F8. Although I have other zooms like 16-35 VR and Tamron SP 70-300 VC, for ease of portability, I did take this with D700 as the only combo for a 5 day travel. This lens is very reliable and highly recommended. totally agree with the previous review; this lens is downright soft at F2 on my D700 but even from F2.8 things rapidly improve and by f5.6 to F11 its as good as it gets. Its light o carry which is a factor and while modern zooms produce better numbers there is more to lenses than pure numbers. just consider that while a lens can be rated theoretically at (say) F2.8 this is simply a calculation based on its FL- its real speed is dependent on the lens element transmission which is typically around 96% (about 97.5% for Pentax SMC by the way..)...the more lens elements, the greater the loss. Primes typically have 50-% less elements so their light transmission and contrast is superior. Just like this little beauty. It "only" gets 7 because its not as good value as the 50mm 1.8 - the latter being much sharper at f2.8 and less than half the price. It's small and light, 15cm mwd/25cm mfd. Ok, so how about some thoughts on how this lens handles on FX? Long story short, if you plan to shoot landscapes at night, wide open, be prepared for ca, duh, and for everything to not be tack sharp at 100%, but what else is new. Aside from that, for the money, you get a great little lens. It's got a nice mwd of 15cm, which I like a lot, AF is very fast too. I really love this lens. Period. It's my first prime lens since my film days years ago. I use D80's for my work, and am relatively new to professional work. I would love to have a 17-55/2.8 & 70-200/2.8VR set, but...well that is a big chunk of change, and my business is not that established. I was really lucky to have a friend that gave (yes gave) me an 80-200/2.8, that he wasn't using because he switched to Canon, and I was immediately blown away by the quality difference compared to my 18-135, which I think is a pretty good lens. So I pined over the 17-55/2.8, and finally chose to try this 35/2.0 prime for my shorter work. This little prime is a real gem, I do outdoor portraits, weddings and events and this little wonder is becoming the lens that gets the most sold photos. It's a normal lens on my DX format, and yes I do a little leg work with it, but in the end this is the lens that gets the most killer shots. I absolutely love my 80-200/2.8, but the image quality is a bit nicer with the 35mm and it is super easy to pack and carry. I love heavy lenses and scoff at people that complain about them. But, when I'm carrying a backpack, riding a bike in the middle of nowhere doing mountain bike shots, I have to say this 35mm is a welcome companion. It is just a very handy, high quality lens, and it ends up getting used a lot. This lens is small, fast, unobtrusive and with very good image quality! At f2.0 it is a bit soft, but stop it down to f2.8 or f4 and the image quality is very good to excellent. My only complain is concerning the lack of AF-S. Although AF is fast on my D200 and D70, I would appreciate AF-S because of the reduced noise and the possibility to promptly mannually override the focus. Moreover, the rotating AF ring in your hand can be a bit annoying. Of course, the implementation of AF-S would negatively affect the size and weight of this little gem. This lens is a definite keeper. Lets get the negative stuff out of the way, so we can all talk about how good this lens is. First, at f2, the cornes are a bit soft, but center sharpness is still good. Second, mine broke because of my own stupidity, and now i need to buy a new one. But the fact is that im going to buy a new one, since this lens is still frequently on my camera even though i have other "more professional" lenses that cover the zoom range. But you just cant beat putting this lens on your camera and taking photos, not scaring anyone dead with your behemoth zoom lens before taking a photo. For unexperienced models, this and the 50mm f1.8 are good choices just because they are incognito and modest in size, but still deliver excellent quality. Buy one today and buy another one if you break it. Good for indoor use, very usefull photoes at f/2.0. I use it most on people (children), and on the D50 the focus speed is not always fast enough (compared to my 24-85 AFS). Also in very quit environments I miss AFS. This is a comparison the 35 f/2.0 and the 35 f/1.4. These lenses are both exceptionally crisp and are, for all intents and purposes, identical. Obvious differences are in the aperture range, manual versus auto focus, and current availability.What follows are the minor differences in performance within their shared aperture range of f/2-f/16. 35 f/1.4 - Sharper at f/2. Out of focus objects are smoother at wide apertures. Better corner sharpness at f/2-f/4. Slightly sharper center f/2-f/11. 35 f/2.0 - Better corner sharpness at f/8-f/16. Overall sharper at f/16. Better control of blooming at wide apertures (blooming is worse on the venerable 85 f/1.4). The 35 f/2.0 also appeared to have slightly better color or contrast throughout the aperture range, though that may be simply due to the 15+ year age of the 35 f/1.4. Barrel distortion is relatively mild and not significantly different for these lenses. There is really no real world difference in photo quality from these 'DX normal' lenses, both are excellent. Worth mentioning is that both lenses focus down to slightly under one foot, so they can function relatively well as macros, with beautiful depth of field properties. Were I to choose, the 35/1.4 would win simply for the sharpness advantage at f/2. Auto focus would otherwise tip the balance towards the 35 f/2.0. Tests were done on a D70 at ISO 200 using a tripod, shooting raw and matching shutter speeds between lenses. Images were converted to PSD in PS with identical color settings and all other manipulations turned off. This is very good lens. Resolution is very good to excelent especially at medium aperture settings. A little soft at F:2 and borders in general could be a little better.Vignetting is a little high at f/2 but low at lager apertures. Barrel distortion is med-low. Good construction and fast AF. This is the new standard lens for Nikon DSLRs, offering the equivalent of a 52mm lens on film. It is even sharper then the 50mm F/1.8 and it is very contrasty. It will focus down to a superb and very handy 8" (20cm) and it has no noticeable distortion. Highly recommended, unless you have the much larger and pricier Sigma 30mm F/1.4. 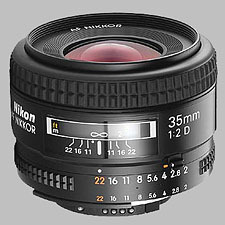 I bought this lens to use primarily on my D70s, with occasional duty on my old manual film Nikon FA. This lens exemplifies everything good about prime lenses: they are sharp, offer great contrast, and have larger aperatures - all in a compact package. The close focusing distance also makes a fun lens for close-up photos. I tend to shoot RAW and apply sharpening in Photoshop, which has yielded excellent results. My example is definitely a bit soft at f/2, but useable for available light shots. Things are quite sharp by f/4, with f/8-f/11 providing critical sharpness. The corners of the image when shooting film are a bit softer than the center, but I don't notice this on my D70s. I use this lens (on a D70) more than any other. There is something very natural about the (52mm equivalent) focal length. Optical performance seems very good to me, though I've never compared it with any of the most expensive Nikkor primes. Still - not a lot of corner softness or vignetting, even wide open, and very little barrel distortion.